Throughout the state of North Carolina, DWI checkpoints are becoming a tool used more and more by law enforcement agencies. In just a brief search of the internet, you can find news articles reporting the results of DWI checkpoints in North Carolina cities from Charlotte to Wilmington. For instance, a March 2016 Wilmington, North Carolina DWI checkpoint resulted in 65 charges for offenses such as DWI, open container, underage consumption, and no operator’s license. In August 2016, the Fayetteville Police Department handed out 141 charges at a DWI checkpoint. These offenses ranged from DWI to seatbelt and registration violations. And in Charlotte, a June 2016 DWI checkpoint yielded 31 charges, seven of which were for DWI, and an August 2016 DWI checkpoint produced six DWI arrests and 28 additional charges. Undoubtedly, DWI checkpoints are a tactic highly relied on by law enforcement agencies in Charlotte, and across North Carolina to prevent people from driving while impaired. As can be seen from the news articles above, these DWI checkpoints also have an added advantage for the police; that is, they also assist the police to find drivers engaging in other unlawful activity, whether that be failing to wear a seatbelt, driving with an expired registration, or driving with an open container of alcohol. In either case, whether you are the primary target of a DWI checkpoint or just strolling through without your seatbelt on, there are some “Do’s” and “Do Not’s” to remember as you approach the DWI checkpoint. This point may seem fairly obvious, but in my experience as a criminal defense attorney, and a Mecklenburg County Assistant District Attorney, I have seen my share of cases where drivers have either not stopped at a DWI checkpoint or made some kind of maneuver to avoid the checkpoint. In most cases, the driver exhibited this behavior because he or she thought they had something they needed to hide, whether that was an open container of alcohol, drugs, or their own perceived impairment. Getting into when you may make a legal turn, or completely turn around for that matter, upon approaching a DWI checkpoint is a complicated area of DWI law that is beyond the scope of this blog. The important thing to remember is that most DWI checkpoint plans have a chase policy. These chase polices allow the police to pursue a person who evades or fails to stop at checkpoint. Thus, not stopping at a DWI checkpoint generally means that the police will chase you and additional charges will likely be brought against you for offenses such as fleeing to elude and resist, delay, obstruct. For the majority of drivers, and their passengers, who pass through a DWI checkpoint, the extent of their interaction with the police will last only long enough to show them their driver’s license. However, it is possible that an officer will ask you to step out of your vehicle for them to further investigate. If this happens, you should step out of your vehicle. In general, the case law suggests that if your vehicle is lawfully stopped by the police, an officer has the authority to order you, whether you are a driver and passenger, out of the vehicle without showing any reason to do so. Not cooperating with the police could lead to additional charges for offenses such as resting, delaying, and obstructing an officer or even obstruction of justice. Without question, waiting to pass through a DWI checkpoint is frustrating for the majority of drivers. 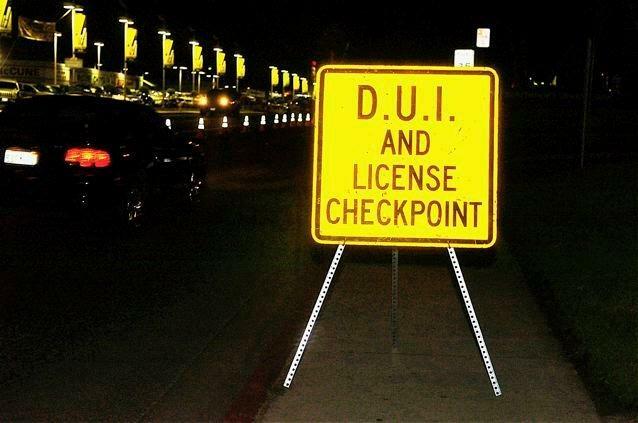 Even though the law allows DWI checkpoints to be conducted, they are undeniably an inconvenience and infringement upon a person’s rights, at least to some degree, to those passing by. We all have somewhere to be or something to do. Nonetheless, it is important to remember that the police have a job to do. With that, being polite, cooperative, and respectful towards the stopping officer is undoubtedly the quickest way through the checkpoint. We all want to be treated with respect, and the police are no different. However, as you will see below, being respectful doesn’t mean doing everything the police ask you to. You must remember that these are not questions you want to answer, nor do you have to answer. The reason the officer is asking you these questions is to begin gaining evidence, because that’s what your statements are, to use against you in developing probable cause to arrest you and convict you of DWI. Don’t try to talk your way out of it. The officer interprets you saying “I only had one drink” or “I’m coming from [insert restaurant or bar here]” as you admitting to drinking and driving. Instead, politely inform the officer that you do not intend to answer any of his or her questions. Be persistent, because they will be. After you refuse to answer any of the officer’s questions, the officer may still ask you to step out of your vehicle. Again, based on the case law, it’s my opinion that you should do so. If the officer suspects you of DWI, the officer may ask you to perform a variety of field sobriety tests, such as the HGN (eye test), the Walk and Turn (WAT), the One Leg Stand (OLS), an alphabet test, a counting test, or even a finger dexterity test. Again, these are not tests that you have to perform, nor are they tests you should perform. Do not think you can “beat” these field sobriety tests. It’s not normal for us to have to walk a straight line or stand on one leg, especially late at night, with cars whipping by, and lights flashing everywhere. If you attempt these tests, odds are you will perform poorly on them. The officer will then use your poor performance on these field sobriety tests as evidence to justify arresting you and convicting you for DWI. Again, politely inform the officer that you are not going to perform any kind of test. If an officer working a DWI checkpoint believes you are driving while impaired, the officer may also attempt to get evidence of your alcohol concentration. One way the officer may do this is by requesting that you submit to a Preliminary Breath Test (PBT). The PBT is distinguishable from an Intoxilyzer 5000 or EC/IR II in that the PBT is handheld and almost always given roadside, such as at a DWI checkpoint. As with incriminating admissions and field sobriety tests, you should not blow into a PBT. The officer only wants to use this evidence against you to support his decision to arrest you for DWI. Additionally, when you are being investigated for drunk driving there are not the same driver’s license consequences for politely refusing to submit to a PBT like there are for refusing to give a breath sample on the Intoxilyzer 5000 or EC/IR II. If you don’t take the PBT, the officer will only be able to tell the court that you refused to submit to the test. If you have been charged with an infraction, criminal offense, or driving under the influence as the result of being stopped at a DWI checkpoint, contact the Mecklenburg lawyers at Browning & Long, PLLC at (980) 207-3355 to discuss your case. While it was not the topic of this blog, there may be defenses to the charges you received, such as contesting the legality of the DWI checkpoint.